I often find myself opening an SSH session to run the same single command. I have everything setup to login without entering a password (Via SSH Key-Based Auth), so I wondered if there was a way to create a shortcut or a batch file in Windows that would load PuTTY or a similar program, then fire off that command (and likely exit if result is good). You can download plink.exe from here. Last step would be to create a shortcut including plink.exe with the desired parameters. To automate a command execution, use Plink (from PuTTY package), not PuTTY itself. If you want to keep using PuTTY, you can use -m switch to specify a command file (Plink supports the -m switch too). You can use putty configurations to achieve this. Load putty and configure your session. Then, before clicking "Open", go back to the "Session" tab (at the top), and save your configuration. Now, you can just click on the shortcut and it will load your session, executing your command. […] go to “Manage Optional Features” then + “Add a feature”. 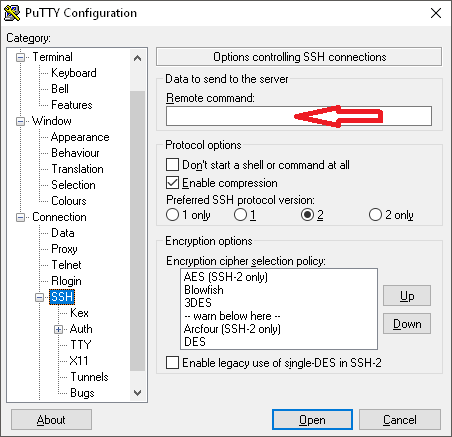 You can then scroll down the list and find the OpenSSH Client (Beta) and OpenSSH Server (Beta) features in Windows. The idea of running another remote service on Windows can be daunting so we do not blame you if you do not want to install the server. Once installed, you can simply fire up your command line and use the OpenSSH client by typing ssh followed by the command such as ssh ubuntu@someIP. C:\WINDOWS\system32>ssh user@host "ls -l ~"
You can also look at software such as mRemoteNG, MOBAxTerm or SecureCRT which will manage your SSH connections for you, this also links with the saved PuTTY sessions so you can apply a template to the session. This is the final "CMD" which I can just save on my FileServer and create a shortcut on my Desktop. set remotecmd="chmod 777 /mnt/mdadm/torrents -R"
Not the answer you're looking for? Browse other questions tagged ssh cmd.exe putty shortcuts or ask your own question.